Just outside of Albuquerque – the largest city in the state of New Mexico – lies the Pajarito Mesa, where several hundred families live in trailers scattered across a dusty plain. While residents legally own their land, a bureaucratic oversight has prevented them from receiving paved roads, running water, and electricity. Over a decade ago, realtors claimed that these amenities were on their way, but failed to tell the landowners that the area has never been legally subdivided for residency or the building of permanent homes. The lives of people on the Mesa reveal a glance into energy’s past and future: while some struggle for the fuel to run their generator for an hour or two each day, their neighbors have been able to afford solar panels, and live comfortably off the grid. During my time with him, he began to construct his own wind turbine, welding it out of scrap metal using a machine powered from his household solar. He even taught me to weld, and as I worked I considered his lifestyle. A thought occurred to me, and I turned to him. “You know, if the apocalypse ever comes, and I survive it, I'm making my way out here," I joked. "It's a beautiful thing to be self-sufficient." He frowned. "It was never my intention to be the last man standing." The last power line overlooking the off-the-grid community of Pajarito Mesa, New Mexico on Feb. 19, 2011. Members of the Alcudia family crowd around a wood stove for warmth in the early morning in Pajarito Mesa, New Mexico, USA on Feb. 12, 2011. 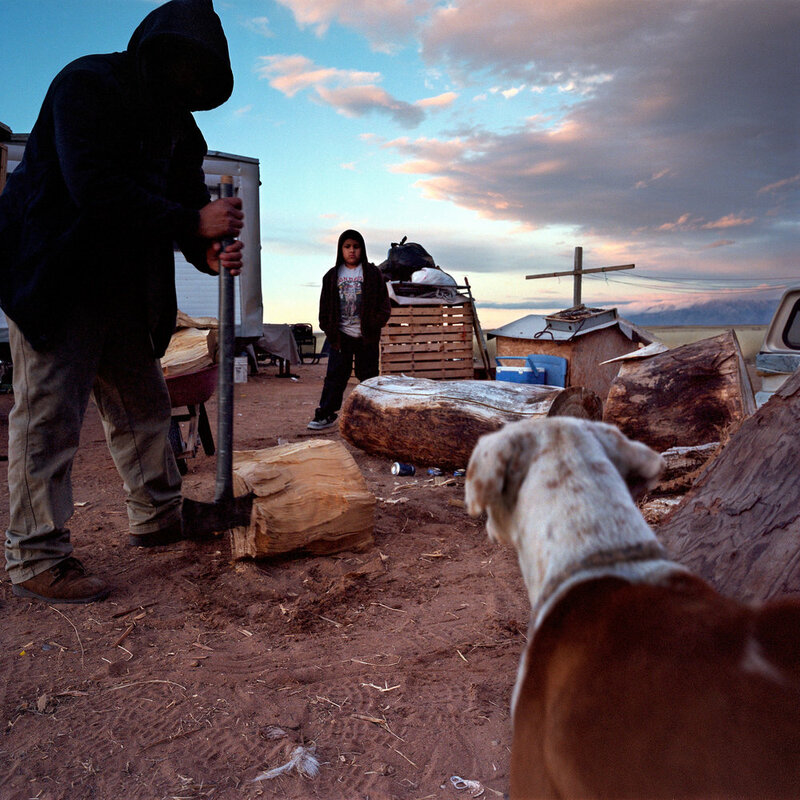 Isidro Alcudia chops firewood while his son, Ricardo, looks on, outside of their trailer in Pajarito Mesa, New Mexico on Feb. 9, 2011. Esperanza Sanchez and her son, Ricardo Alcudia, peer into a cooler that they use for food storage at their home in Pajarito Mesa, New Mexico, USA on Feb. 18, 2011. The family owned a refrigerator, but sold it because they needed the money and wanted to reduce their household energy expenses. Isidro Alcudia, front, and his brother Epifanio wait in the early morning for a call offering them work as day-laborers in their trailer in Pajarito Mesa, New Mexico, USA on Feb. 17, 2011. The two work primarily in construction, but fewer people are building as a result of the global recession. They were not offered work on this day. Carlos Proffit outside of his home in Pajarito Mesa, New Mexico, USA on Feb. 15, 2011. Mr. Proffit moved to the Mesa "to escape the rent cycle," and then built his own home. He slowly learned to install and in some cases build solar and wind solutions for his home over the course of many years. A stack of batteries that stores the energy from solar panels at the home of Lourencio Perez in Pajarito Mesa, New Mexico on Feb. 12, 2011. Carlos Proffit and Dora Verdin-Everett relax in their solar-powered home in Pajarito Mesa, New Mexico, USA on Feb. 15, 2011. Isidro Alcudia and his teenage daughter, Roxanna, in their home in Pajarito Mesa, New Mexico on Feb. 18, 2011. Carlos Proffit uses a solar-powered welder to build a home-made wind turbine from scraps of metal at his home in Pajarito Mesa, New Mexico, USA on Feb. 15, 2011. 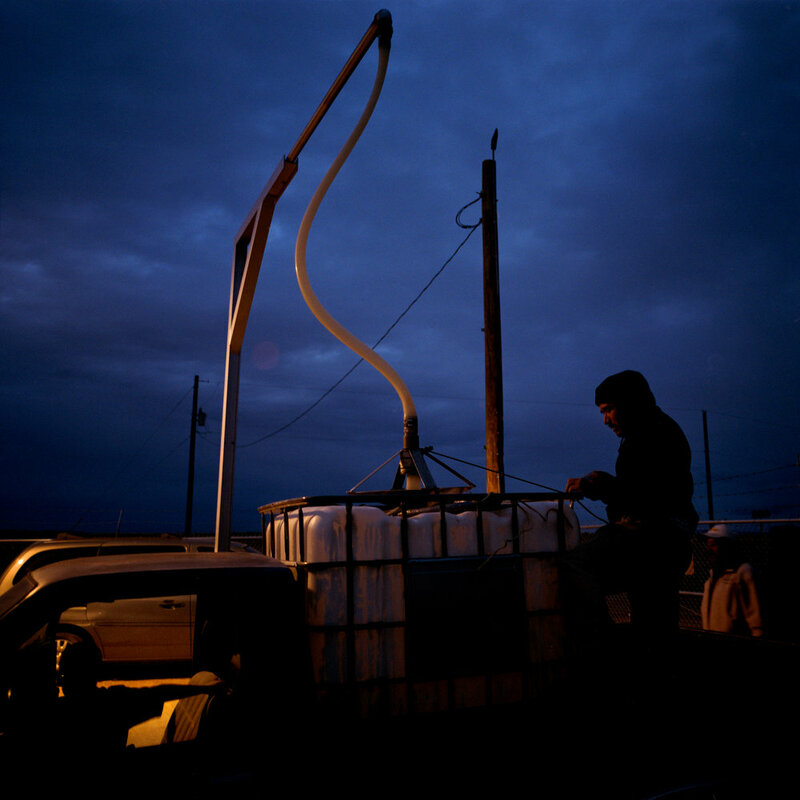 Isidro Alcudia fills a container with water from a pump that was installed at the base the Pajarito Mesa, New Mexico, USA on Feb. 18 2011. The pump is powered by the last power line before the Mesa. Members of the community haul their water from a pump that the city provided after a decade-long search for funding and permission. Members of the Alcudia family bury a deceased pet dog outside of their home in Pajarito Mesa, New Mexico, Feb. 9, 2011. 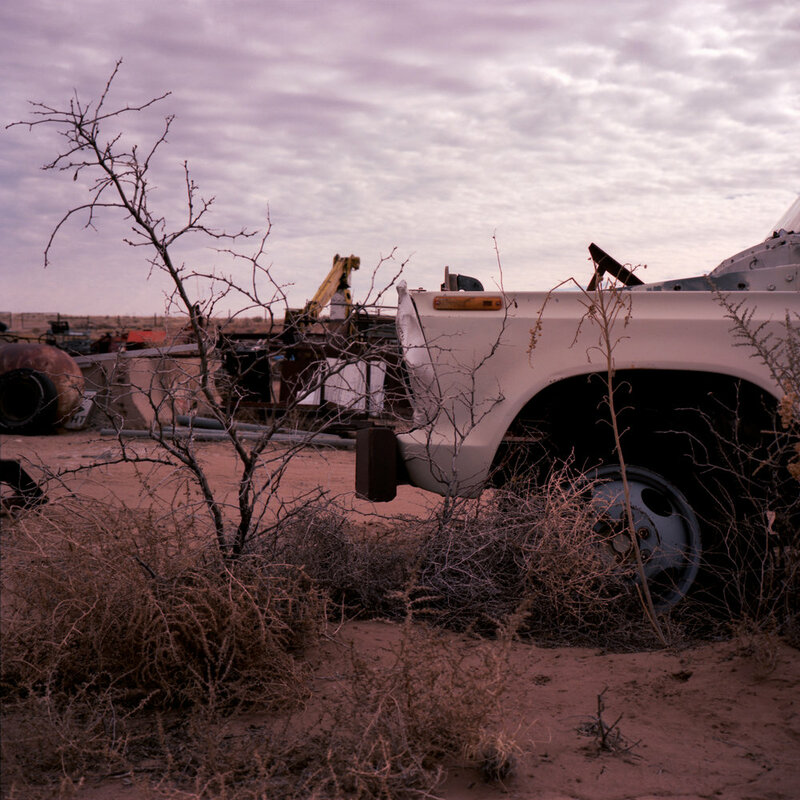 Bushes grow next to an unused truck in Pajarito Mesa, New Mexico, USA on Feb. 19, 2011. A home-made device that turns wind into energy at the home of Lourencio Perez in Pajarito Mesa, New Mexico on Feb. 12, 2011. A child plays outside of his home in Pajarito Mesa, New Mexico, USA on Feb. 12, 2011.